Do I want to go to a Comic-Con? Comic books. You either read them or you don’t. There’s not a great deal of gray area for people when it comes to reading and collecting comics. It’s a lot like anchovies- you love them or you hate them. Luckily, I’m not here to write about comic books (or anchovies), but rather a series of events that more and more people can’t help but hear about in the news, on TV, in magazines and all over the internet… a Comic-Con. The action films of the 1970s shot in and around New York embrace a curb-level realism – an obsession with gritty locations – that no studio or backlot can possibly reproduce. The storefronts, dented cars, barren parks and filigreed subway els dress movies like The Seven-Ups, The Taking of Pelham 1-2-3, and the French Connection, racing along with the action in glimpses and high contrast light and murky shadow. But there was life in those shops and apartments and row houses, life in a city that no longer exists, a life that was both tougher and less material than the New York three decades on – a city that still expects cartoonish credit-laden consumption even as the consumer markets that created neon expectations can no longer deliver on the promise. 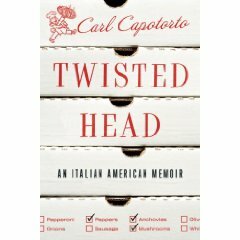 In one of the Bronx neighborhoods Ray Scheider drove so recklessly through in chase of some drug-dealing punks, a dysfunctional family of Italian-Americans sweated out the tough times – times that inspired Twisted Head, a hilarious and cutting memoir by its youngest progeny, the actor and writer Carl Capotorto. You may remember Capotorto as “Little Pauli” in The Sopranos, but there was nothing of the mythical mob glamor about his childhood in the Pelham Parkway section of the Bronx. Capotorto was the youngest child of a family dominated by a father with a violent temper, and the book’s title comes from the literal translation of Capotorto – “twisted head” – which seems so perfectly suited to the temperament of Philip Vito Capotorto. The Bronx of Carl Capotorto’s youth was still recognizable in the Bronx of the 1980s, where I arrived as a rookie political reporter for The Riverdale Press. Congressman Mario Biaggi, the pornographic Globe Theater, the shops on Arthur Avenue, Bronx Park and even Cappi’s Pizza and Sangweech Shop under the el on White Plains Road are all familiar. But equally familiar is the close-in third generation immigrant American experience in New York; mine was Irish and based around Yonkers, but Capotorto’s experience was the same as many of the kids I knew who grew up around Dunwoodie in the 60s and 70s. I recognize the characters from their families, and from my own – the always-simmering pot of “gravy,” the uncles and their tales of European war, the trips to Playland, the allure of “the city,” the music, the cars, the long family gatherings. Capotorto keeps his personal memoir moving and although his father’s anger provides the dramatic core of the story, the episodes with the women in his life – his mother, his sisters, his grandmother – give Twisted Head much of its richness and humor, as does the author’s struggle with homosexuality and acceptance in adolescence. The story never tips into either self-absorbed pathos or two-dimensional ethnic and sexual cliche; Capotorto deftly balances the details of the city and the times with the story arc of his family and his life. In the end, despite the author’s evident personal struggle, you’re not at all sorry for Carl Capotorto’s early life in the Bronx. It was, after all, a rich childhood filled with picaresque characters that gave Capotorto a rare gift: a story well worth telling. Click here to see why these books were challenged. And read one of ’em. That’ll show the bastards.